In Quebec, I did some wing chun during a year before coming kunyu academy. My motivation to begin Kung fu like my fiancé Jonathan was the idea to come in China because the inner experience of Kung fu attracted me the most. For me, since the beginning, kung fu is not just a sport, it’s a discipline for visit the energy inside and I was sure to find this on the land of Kung fu, China, the origin. 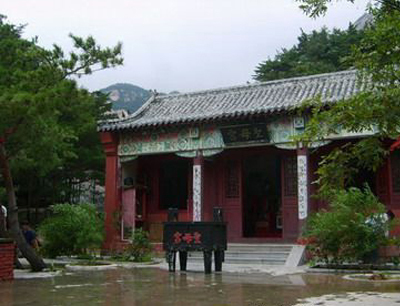 I like the philosophy of Chinese martial arts. 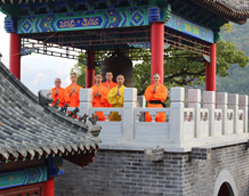 2.The context of the academy, the fact that we have the opportunity to put Kung fu in the center in our life for the duration of our trip, give me the chance to find what I was searching for: development of inner energy, self discipline( psychological, physical and psychic) and healthy condition. I came here for Wing chun at the beginning, but my best gain come from the discovery of internal martial arts Baji, Taichi and Bagua. Qigong also even if it’s still really hard for me. 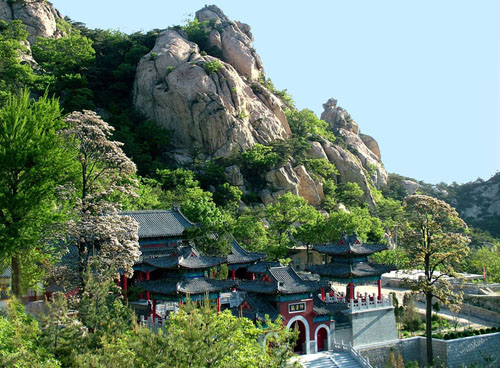 Kung fu training at Kunyu mountain helped me to find a balance with myself and eventually with people in my life. 3 First, the friendly contact with translator makes me feel at home. When I arrived, I felt rapidly in comfort here because of them, because they make us feel safe, welcome and they are really perfect for helping us. All professional at the academy give the feeling we are at home. But, who influenced the most my experience here, it’s definitely every shifu. After some weeks, we understand well who they are and it’s a pleasure to learn from them and learn by the example they give. Shifu teach us just by breathing and this is amazing, this is the best way to learn. 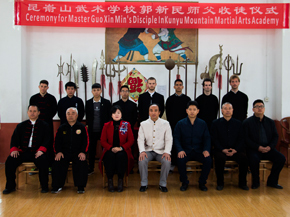 Of course, master Guo is the most significant master for me, but also master Liu who teach us so often. With the different personality and way of teaching, master Yu influenced my learning in a good way. Really, every master are awesome. Just by walking around, smiling to me , master Gao, wang and chen and xu helped me to understand what is the life related to kung fu. I will remember all of them all my life and I will talk about them to my students and of course, my future baby. After my family, those shifu, particularly Guo are the most significant people I met in my life. 4.I answered a little bit at this question in number3, but I will add some elements. My experience at the academy overcomes what I expected to live. Rapidly, I put all my trust in my shifu and he brings me further than I thought. The academy gave me the chance to participate to show and competition. Those activity make me feel appreciate, integrate and push-up my self-esteem. It was an honor to perform for the school and that made the adventure much more exciting. I felt the school recognized my effect and I say thank you for that. Also, I’m really happy the school let me practice a big variety of style. 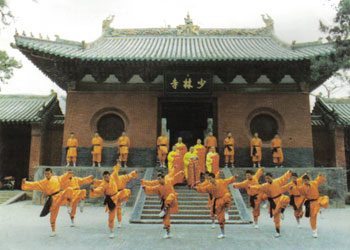 During a while, I was training Tai Chi, Qigong, Wing chun, Baji, Sanda and Bagua in the same time, but that give me many different experience and let me discover the main line, the central concept who link every Chinese martial arts. I think I get good basic for continuing to develop what I was searching for in my life. Thanks to believe in your student and always share your kung fu with passion, patience and quality. About the life in the academy with students, everyone was a part of a big family and master was strict enough. 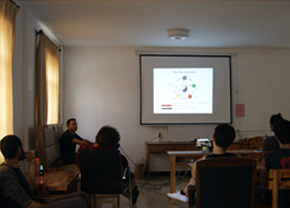 I have admiration for the patience and tolerance of translators, masters and other workers here with everyone. The respect here is a big plus for the academy. Mountains, temple, river, lake, village, or chaos.Everything around is awesome. Just a little bit sad that they cover everything with concrete, put light on the street and built new buildings around. Anyway the sound of the roaster in the mornings, it is so nice. 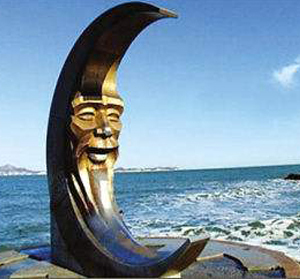 I really like Kun yu shan, but yantai is just a city. I don’t like city that much it’s why your academy is so in a perfect location for me. Muping is a lovely city because of people. We visit shanghai and Beijing. 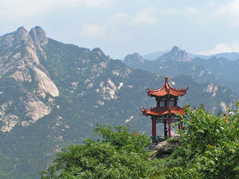 Definitely Kun yu mountain and Muping people are wonderful and make me like China. Thanks for everything, for every moment, for helping me during my pregnancy as well as a family. I felt accepted and I never felt the need to contact my family for that. Your school was perfect!